If you have been injured at work, you do not have to accept delays in the insurance company's response. Tell them you mean business by contacting our aggressive workers' compensation attorneys today: 1-800-898-HAYS. Wage benefits are an established legal means for a worker injured on the job to collect a portion of their wages if they are unable to return to work for a certain number of days. Georgia workers' compensation law allows injured workers who have missed seven consecutive work days due to a workplace accident or injury to collect wage benefits (payable after 21 days from the first day of work missed). 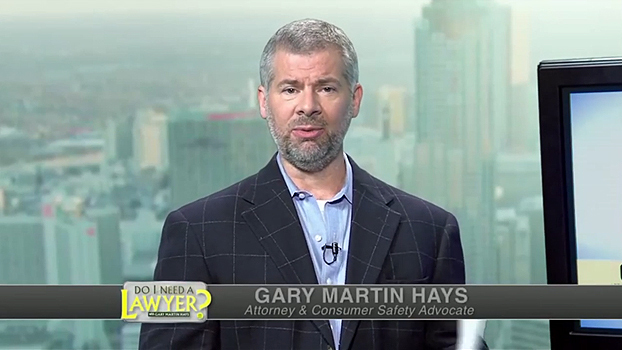 In this segment of Do I Need a Lawyer, Gary Martin Hays discusses 3 types of benefits you can receive through workers' comp. Wage benefits are two-thirds of your average weekly wages, based on the wages you received for the 13 weeks leading up to the time of your accident. There is a cap on the amount of weekly wages you can receive which changes every year. The authorized doctor must say that you are disabled for work-related injuries in order to receive these benefits. Beware: wage benefits are often miscalculated! There is a specific formula for determining the portion of your wages you should receive, yet this is often applied incorrectly. Don't be denied benefits that are owed to you! How long can I receive wage benefits? You may be entitled to a lifetime of wage benefits if the injury is catastrophic (such as a brain or paralysis injury). But in other cases, you will be entitled to receive benefits for up to 400 weeks (if the accident occurred after July 1, 1992). There are exceptions. For example, if you can return to your job but can only work with limitations or restrictions you may be entitled to reduced benefits.